caterpillar, originally uploaded by ordinarymoment. Always happy to share my garden with friendly, helpful creatures. 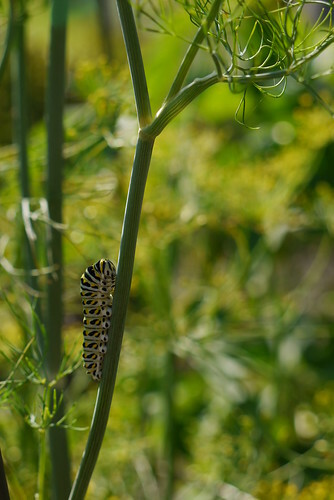 Wispy strands of dill, food for the Black Swallowtail caterpillar. Lime green, striking pattern. Overwhelmed with the gorgeous variations of great and small living things. Creativity at its finest, colors + patterns…too many to begin imagining. And I think…I never want to lose this sense of wonder. This appreciation for creation, the sacred beauty so generously made for us. To stop, to look, to notice. How can we not? It is all around us, waiting for us to see. Open your eyes, your heart…what will you discover?